We’d love your help. 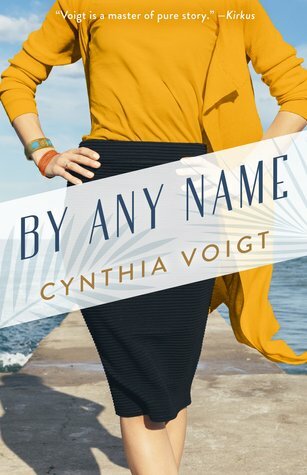 Let us know what’s wrong with this preview of By Any Name by Cynthia Voigt. Rida is an orphan out of California who dances for the troops in the USO. Spencer is a naval officer with roots deep in New England's upper crust. They meet during World War II at an Officer's Club dance, and Spencer might have been dissuaded if he saw just one engagement ring on her finger, but instead, he sees four. The courtship is easy, Rida wins him and wears his ring Rida is an orphan out of California who dances for the troops in the USO. Spencer is a naval officer with roots deep in New England's upper crust. They meet during World War II at an Officer's Club dance, and Spencer might have been dissuaded if he saw just one engagement ring on her finger, but instead, he sees four. The courtship is easy, Rida wins him and wears his ring alone. But Rida is a wild card, and Spencer's family can't accept her unconventional approach to marriage, motherhood, and life. Even Rida's four daughters struggle to understand her, but for them it becomes a quest--to untangle the mystery of their stubborn, off-beat, clear-sighted, loving, and above all mesmerizing mother. Award-winning author Cynthia Voigt has penned a novel for readers who grew up loving her Newbery Award-winning novels for children and young adults. By Any Name features an indelible woman who sees lines as meant to be crossed, changing the lives of all who come into contact with her indefatigable spirit. To ask other readers questions about By Any Name, please sign up. As a fan of Cynthia Voigt’s many novels for teens, such as Dicey’s Song, I was thrilled to discover this new adult contemporary. By Any Name is an historical fiction that is reminiscent of Margaret Laurence’s The Stone Angel. The story of Rida’s life is told through the eyes of her daughter Beth and really captures the era beautifully. Also, the references to Little Women by Louisa May Alcott that are sprinkled throughout the story add to its theme in a unique way. I might be presumptuous in refe As a fan of Cynthia Voigt’s many novels for teens, such as Dicey’s Song, I was thrilled to discover this new adult contemporary. By Any Name is an historical fiction that is reminiscent of Margaret Laurence’s The Stone Angel. The story of Rida’s life is told through the eyes of her daughter Beth and really captures the era beautifully. Also, the references to Little Women by Louisa May Alcott that are sprinkled throughout the story add to its theme in a unique way. I might be presumptuous in referring By Any Name to The Stone Angel by Margaret Laurence because it is probably more recognizable to Canadians. However, By Any Name has so many timeless themes, such as aging and reminiscing that one cannot help but connect these two literary works. Voigt has created a spunky main character in Rida who exudes strength and independence in a time where women were typically oppressed. Rida is definitely inspirational and those familiar with Cynthia Voigt’s other works will find a similar well-developed fierce female in this book as well. One really interesting aspect of this novel is that it is told through the perspective of Rida’s daughter, Beth. This point of view actually makes for a more reliable narrator, as Beth is looking at Rida’s life from the outside and has a much more accurate memory. Through Beth, the reader can get a sense of what having a mother like Rida was like and how she had a profound influence on her daughters. Beth is putting all of the pieces together about her mother’s past throughout the book and it all comes together wonderfully towards the end. For those who enjoy classics, Little Women in particular, you will enjoy the allusions and connections that By Any Name has to this much loved novel. Rida names her daughters after the ones in Little Women and the girls themselves are definitely similar in personality to the March sisters. The shared theme of raising well-adjusted daughters adds to the flavour of Voight’s novel, as the reader can relate to the characters and story of Little Women. Entertaining story of Rida, a USO dancer, who is unconventional, dresses boldly, believes lines are meant to be crossed, and is off-beat. Rida marries a Naval Officer from an upper crust family and the story spans the decades and details Rida's relationships with her in-laws, high society, and her 4 daughters, who struggle to understand their mother. Rida is an orphan who meets Spencer while she is serving in the USO during WWII and he is serving as a naval officer. They meet at an Officer’s Club Dance. Rida loves to dance and have a good time. She is an orphan from California and has no idea of her origins but doesn’t really care. Actually she considers her unknown status as a mandate to speak her mind at all times and to defy what other see as necessary conventions of behavior. Spencer has one thing on his mind, to divert his constant worr Rida is an orphan who meets Spencer while she is serving in the USO during WWII and he is serving as a naval officer. They meet at an Officer’s Club Dance. Rida loves to dance and have a good time. She is an orphan from California and has no idea of her origins but doesn’t really care. Actually she considers her unknown status as a mandate to speak her mind at all times and to defy what other see as necessary conventions of behavior. Spencer has one thing on his mind, to divert his constant worry about being killed in this nasty, crazy war. Rida totally diverts his paranoia and rivets his attention on her startling nature. This works well and promises for some audacious moments, especially when she informs him she is engaged to four other men. She admits they all know about each other and don’t mind at all. Spencer thinks, as a young man of the gentle, upper class Boston aristocracy, that he must make Rida realize the error and danger of her ways. Of course, he fails miserably and decides the only way to protect her is to marry her. Theirs is a love affair that truly understands and accepts each other’s nature, his of academic propensities and hers of practical truth and planning for the future. This then is a unique novel of two characters who complement each other perfectly but who are hardly understood by his Hargrove relatives. The story is told from the narrative voice of Rida or Mumma (as she is called by all) who supports her husband through his obtaining a Ph.D. in classics and starts her own realty business. But the gripping essence of Mumma’s story is the way she shocks Spencer’s family and the acquaintances of her daughters with her refreshing truthfulness and unwillingness to conform to dress and social conversation. Numerous funny scenes fill these pages in which Mumma shocks all and yet also can perfectly read people’s false veneer to who they are truly are. In one particular scene, she intuits that a certain teacher is taking advantage of her daughter and sets about eliminating that person before damage can be done. Even the end of the novel is mesmerizing as we see how Mumma handles her husband’s life and death and then plans the immediate days after her own death. The reader knows that her personality will be the subject of days and days of thoughts and conversations among her daughters as they try to figure out just who she was and remain just as befuddled and mournful of her dynamic, astonishing presence! Cynthia Voigt’s foray into contemporary adult fiction is delightfully well-crafted. The plot is simple but the characterization is the central focus that defies any stereotypical pattern. Nicely done, indeed, Cynthia Voigt!!! The first 100 pages of this book just FLEW by! I read Cynthia Voight's books and loved them when I was in middle school (Homecoming and Dicey's Song! So great!). I was really excited to see her name on a new book and I'm glad to have gotten an advance copy. By Any Name is the story of a woman's life told in the recollections and gatherings of her four daughters. The concept appealed to me and I already like the author so I was excited to read it! I stayed up WAY to late reading the first section The first 100 pages of this book just FLEW by! I read Cynthia Voight's books and loved them when I was in middle school (Homecoming and Dicey's Song! So great!). I was really excited to see her name on a new book and I'm glad to have gotten an advance copy. As a fan of Voigt's young adult novels, I was happy to learn of this one for adults. It ended up being a little too quirky for me to love completely. It centers on Rida, a strong-willed woman who marries into a rich family and has 4 daughters (named after the daughters in Little Women. Her daughter Beth narrates most of the story. It just didn't feel like there was much of a plot, and Rida's character was grating after awhile. I somehow was confused by the story in the beginning, and then realized it is the story of a woman's life told in the recollections of her four daughters. The mother seemed cruel and odd at first, but turns out her daughters understood her eccentricities and loved her. I enjoyed the book, but it didn't really stick with me, so I only gave it 3 stars. I added this to my TBR pile because Cynthia Voigt was one of my favourite authors from when I was a young girl. Unfortunately, despite a promising premise and character I found this one to be dull and boring. It's never a good sign when you keep checking to see how many pages you have left and I did that a heck of a lot while reading this book. I read many of Cynthia Voigt's young adult books when I was a kid and loved them. I was thrilled to see she had a new adult book out. I haven't read her in years and she did not disappoint! I loved this book! Four daughters trying to make sense of their mother's past and personality is an interesting plot but I found it difficult to warm up to the characters. Nevertheless, I liked the book especially the first section. A bit of a slow start, but redeemed itself by the end. This book has unusual plot that kept your attention; outspoken, misfit wife in a high society family. The first half was fun and interesting, but the second half lost my interest. I listened to the audiobook and I wasn't interested enough to grind my way through it. It started off ok but I just found all the characters unlikable. I received a digital copy of By Any Name from NetGalley in exchange for an honest review. I loved Cynthia Voigt as a child & felt compelled to read her new novel. I found the story pulled me in, & at times, I was so frustrated with her in-laws & friends that I wanted to stop reading--definitely the sign of a good author if you can make me dislike a character or two! Rida definitely was a unique character & her family & daughters benefited from that. I did find parts of the stor I received a digital copy of By Any Name from NetGalley in exchange for an honest review. Entertaining read -- the characters are great. Jackaroo: Ratte Cynthia Voigt is an American author of books for young adults dealing with various topics such as adventure, mystery, racism and child abuse.